Scale with ease using Sempercon’s open standard backend interface to integrate with third party data service providers and swiftly add new functionality. Fully customize your app’s security measures, user interfaces, administrative controls and more. Scale with ease by using Sempercon’s open standard backend interface to integrate with third party data service providers and swiftly add new functionality. Fully customize your app’s security measures, user interfaces, administrative controls and more. Building the backend of mobile, tablet, web and smart device apps requires a diverse team with coding, database, encryption, integration and other skills. Most businesses—even enterprises–don’t have the bandwidth to meet this challenge internally. With the Sempercon Application Platform, our customers are releasing scalable, secure and reliable apps often managed by our engineering team. SemperCon is one of few source license model mobility platforms on the market that allows users to fully-own and fully-manage their apps. Unlike with BaaS and SaaS mobility platforms, product developments can be exploited with competitive advantage intact allowing our clients to leapfrog over their competitors. Your device management system’s features and capabilities will be customized depending on your data intelligence requirements and the devices, equipment, and services connecting to your solution. With an administration interface, you grant access privileges to end users and can manage all of the devices connecting to your IoT system. Dashboards are developed for your customers or end users to easily access critical data parameters across the web. The data collected, stored and monitored through your IoT solution can trigger customized alerts and notifications depending on your requirements. Every IoT solution’s backend is developed to be compatible with wot.io and other IoT data exchange platforms that enable direct access to a growing list of third-party, value-added services. Rick and his team at SemperCon have by far exceeded my expectations. I had the idea of creating a new social networking app, and SemperCon went above and beyond to turn my vision into a reality. Rick and his team took my mock-ups/designs and optimized my app to have the best UI/UX possible. They were then able to develop a fully functioning iOS app in a very timely matter, and at a very reasonable price. My app turned out better than I ever imagined. SemperCon has been an invaluable partner in the development of our organization, Ride Health. They helped us turn a wireframe mock-up and list of features into rigorous specifications for web development - and then made it into a reality just weeks later. When we asked them to integrate brand new technologies and APIs, SemperCon took on the challenge with enthusiasm. Beyond their technical skills, what stands out most is their honesty, integrity, accountability and transparency when working with clients. I would strongly recommend SemperCon to anyone looking for a true partner in web and mobile development. SemperCon turned our idea into a detailed specification and then into a full application running on multiple mobile platforms. They are our go-to team for mobile app development. Sempercon is the ultimate development partner for any startup lacking a technical co-founder. We were so impressed with the quality and speed with which SemperCon was able to develop our app (not to mention their competitive pricing), that we’ve continued to use them time and time again. After developing an MVP app for Android, Sempercon then developed a matching iOS app and has since worked on the release of multiple product updates. SemperCon developed the Android app for our BLE temperature sensor program. The app requires control and monitoring of three individual BLE sensors and logs the data being generated for analysis. I am extremely pleased with their work, attention to detail and level of communication. It is a great feeling knowing that I have found a company that I can consider part of our development team. Although this first program is Android based we will definitely be using SemperCon for the development of an iOS version and future web application requirements. Rick and his team were helpful and responsive over the long haul as my company developed its first iOS app for consumer market release. Over the course of 9 months (and counting), they worked with us through both the design and implementation process, and subsequent QA and post-deployment issue resolution. I am happy to recommend them as a top-notch service provider for mobile app design and development. We hired Sempercon to create iPhone and Android applications that demonstrated our proprietary Wi-Fi connection technology. Sempercon did a great job of understanding the technology, designing the applications, and delivering quality software and documentation on schedule. Their leadership was also exceptional in helping us promote our technology by introducing us to partners and test markets. For our sports-related app, Sempercon was able to set up beta testing with a stadium during a full season of minor league baseball. Sempercon's team, is passionate about new technology and a pleasure to work with. I highly recommend Sempercon. Sempercon was vital in creating our app. When we started, our team was three inexperienced “business people” with no tech skills. The SemperCon team was able to guide us through creating wireframes, and specification docs to get our idea rolling. Along the way, we received a lot of practical advice that we feel others would have used as opportunities to upsell different solutions onto us. Once development started, the entire team was really responsive and we were surprised by how efficiently they worked. As we deployed and iterated, they continued to be responsive and it was comforting knowing they didn’t tune out once the bulk of the work was completed. Overall, it was a great experience working with the SemperCon team - and we continue to do so. I was looking to develop a mobile, web-based app that would become a new service offering for my company. I couldn’t be more pleased to have found a partner in Sempercon. Despite having the vision, we didn't have the IT capacity to develop this internally. 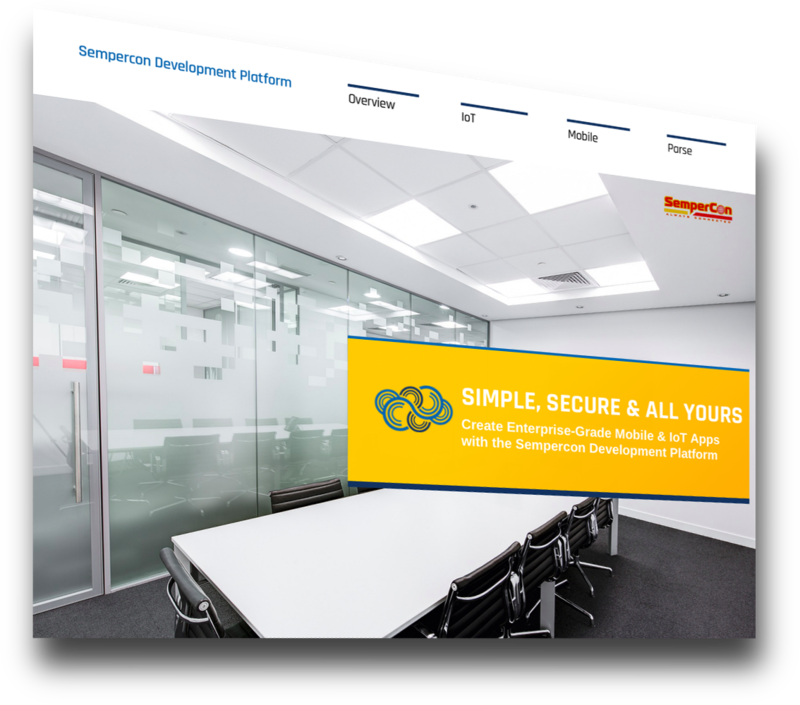 Sempercon was able to guide us through all phases of the development process - from the early design work and specifications through to the development and testing of the application. Throughout the entire process they maintained constant contact on the status of the project and met all of their deliverable deadlines. We needed a capable and flexible development partner to help us support and grow our Fleet Intelligence application. SemperCon has proven to be a technically strong and reliable long term partner for our company. Sempercon helped us make sense of our ideas for an app and quickly translated them into design specifications. Their engineers delivered us a functional prototype within weeks. While they led our app development effort, we were able to focus on the many other action items requiring our attention. By connecting our emergency lighting equipment to the web our technicians can now access all of our systems remotely and diagnose problems without actually having to go on-site. Our field service team can now work more efficiently than we could’ve imagined.